Hiruzen Hills, we create a room that directs nature-enclosed healing space. From each room you can enjoy a variety of beautiful scenery in every season of Hiruzen Plateau, you can enjoy an elegant stay with spacious interior and scenery. Hiruzen Hills offers three types of rooms to satisfy customers.Please choose your favorite room. ★Loft TW★Two beds+Room of tatami room.Up to 6 adults are available! High functionality makes it perfect for customers who stay longer. Because it is limited to 3 rooms, we recommend that you book your reservation as soon as possible. There are 2 single beds on the ground floor (1 person x 2 units = 2 people). The loft area is a tatami (woven-straw) Japanese-style room and can accommodate up to 4 adults. There is one double bed on the first floor (2 people × 1 unit = 2 persons available). ※Both twin and double can see the Hiruzen three mountains from the window. All the rooms are equipped with bath / toilet · air conditioning / heating · empty refrigerator · hair dryer · liquid crystal TV · kettle pot. ※In addition, all rooms are non smoking. We have room wear, bath towel, face towel, toothbrush, body towel (humidifier, trouser press, air purifier are also available for free rental). In addition, shaving and cotton are available at the front desk. ※Humidifiers, trousers and air purifiers are limited in number, so please contact the front desk if you wish. ※In addition, if there are items described in the plan, that will be given priority. 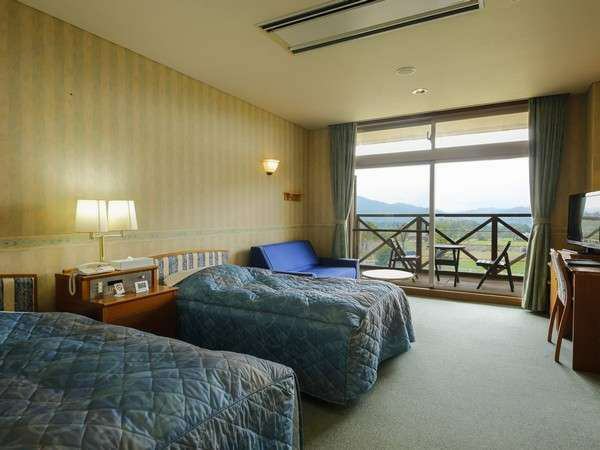 ★South Twin Western-style room★From the balcony you can see the scenery of an open highland! Please enjoy the stylish furniture set in a spacious space and the fine space brewed by lighting.We also offer wheelchair compatible barrier free rooms. From the room on the south side, you can see the Hiruzen Plateau. From the room on the north side, you can see the mountain ranges of Hiruzen three mountains. The room with barrier-free is in the south side. All the rooms are equipped with a bath toilet, air conditioning / heating, an empty refrigerator, a hair dryer, a liquid crystal TV, and a kettle pot. 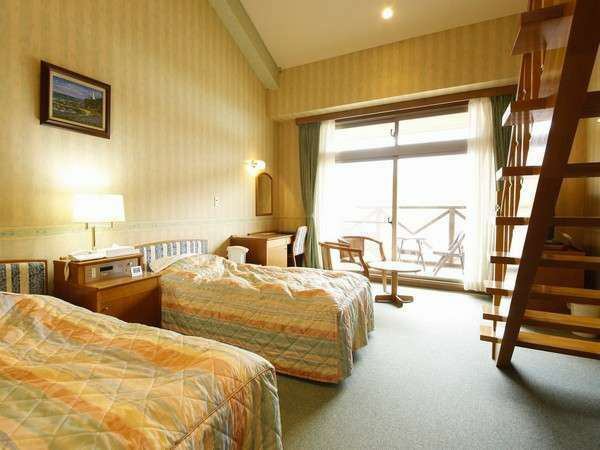 ★Japanese-style room★We have rooms of 14 square meters and 21 square meters according to the number of people! 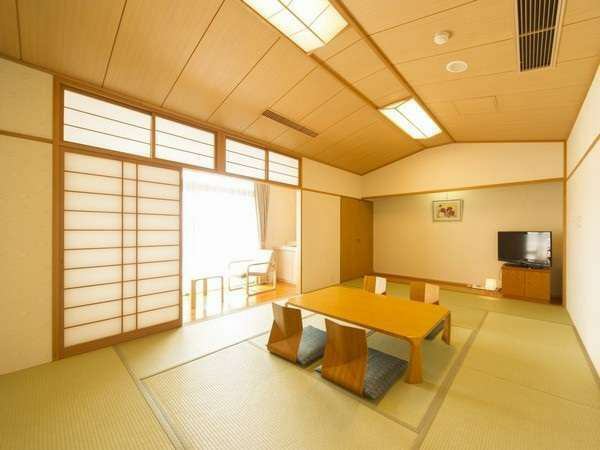 Spacious and spacious Japanese style room. The atmosphere of Tatami room full of taste and refreshing air of Hiruzen Plateau produce a relaxing and relaxing space. Please enjoy the refined Japanese space. Japanese rooms are available in 14-square-meter type and 21-square-meter type rooms. All the rooms are equipped with toilets, air-conditioning, air-conditioning fridge, hair dryer, liquid crystal TV, kettle pot. Please use the public bath in the facility (2nd floor) for the bath. The washbowl space is in the room. We accept payment with various credit cards.